It appears the violence at SeaWorld still hasn't stopped. SeaWorld guest Ashley Miller attended SeaWorld San Antonio's Dine With Shamu show on Saturday when, she says, she saw a bit more than she expected. The afternoon show featured two young whales - siblings Sakari, 6, and Kamea, 2 - who weren't exactly keen on performing. 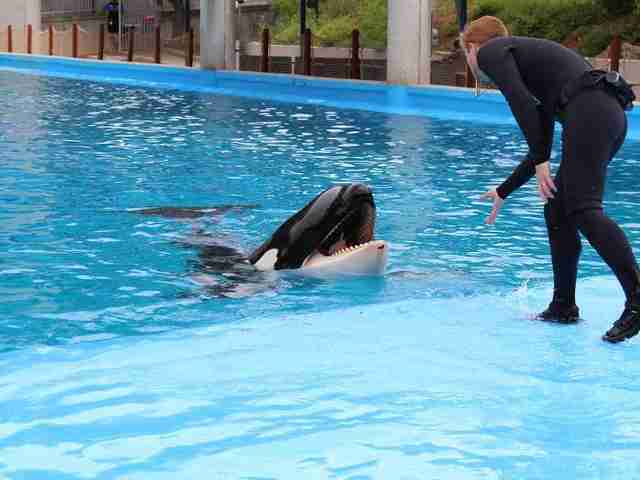 "[They] were seemingly expected to do the whole Dine With Shamu session alone, and the two decided they would rather play than listen to cues (in between going to the gates to see Takara, their mother)," Miller told The Dodo. "Eventually they became bored and started fighting, even hitting one another hard enough with their flukes while on the slide-out to cause the other to slide quite a ways in the other direction." "It continued escalating, but the trainers just laughed it off and told guests that the calves were playing, instead of trying to redirect their focus or let Takara into the pool to discipline them," she said. Eventually the two whales disappeared beneath the surface, according to Miller, and "continued thrashing about." When they surfaced, she said, Sakari's chin was "dripping with blood." "I can't say whether it was a bite or if she hit the wall, but when the trainer saw, he quickly had her turn to the side along the pool with her chin under the water to give her a back rub, obviously hoping nobody saw it," Miller explained. 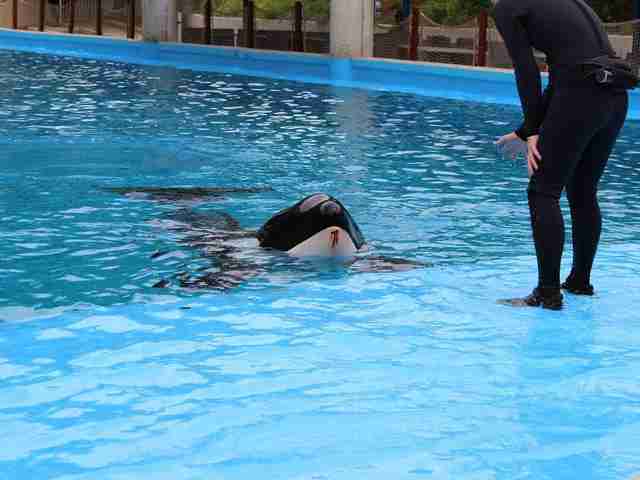 Photos taken by Miller appear to show Sakari surfacing with a damaged chin before a trainer kneels down beside her on the slide-out, angling her away from the audience. Miller said the experience left her "frustrated." SeaWorld announced last month that it would be ending its breeding program, a welcome indication that orca captivity could soon be at an end. But the news also raised questions about what would happen to SeaWorld's current generation of orcas, whom the park is determined to keep in captivity despite ongoing concerns about welfare issues - including numerous reports of violence like this one. SeaWorld confirmed Saturday's incident in a statement to The Dodo, saying that the orcas "were engaged in play behavior when trainers noticed Sakari had a minor scrape on her rostrum. Veterinarians examined her, and determined no medical treatment was needed." "Sakari is doing fine, and we expect this to heal quickly," Aimée Jeansonne Becka, SeaWorld's senior director of corporate communications, said. "Just as with killer whales or orcas in the wild, our whales grow and learn through play behaviors and interactions with other members of their pod. It is normal activity found in all healthy wild and zoological social groups. Scrapes, rakes and other superficial abrasions are all part of normal killer whale activity." However, several orca experts have previously told The Dodo that wild orcas rarely fight with each other to this extent. SeaWorld's orcas come from several different populations and are vastly more crowded in their tiny tanks than they would be in the wild. This crowding, coupled with the stress of captivity, leads to an increase in violence - and means victims of bullying don't have the ability to run away like they would in the wild. And the incidents go far beyond just accidental scrapes. Dr. Heather Rally, a marine mammal veterinarian currently affiliated with PETA, previously reported seeing orcas with extensive rake marks from teeth when she visited San Antonio. Sarah Fischbeck, a former diver at SeaWorld San Diego, told The Dodo last year that workers would regularly find strips of skin the orcas had ripped off each other at the bottom of the tanks, and witnessed a host of other violent incidents. The in-fighting has even turned fatal. In 1989 an orca named Kandu broke her jaw while violently ramming a tankmate. She severed an artery and died spurting blood from her blowhole while her infant daughter circled, panicked, around her. As long as SeaWorld insists on keeping its orcas in their overcrowded tanks the violence will likely continue. Unfortunately, welfare still seems to take a backseat at the infamously embattled company.